Albert H. Small designates GW as the permanent home of his prized collection of artifacts on the history of Washington, D.C.
A museum that will include memorabilia documenting the rich history of the nation's capital will soon be erected on GW's Foggy Bottom Campus, thanks to the generosity of Albert H. Small, one of the nation's foremost collectors of historic documents. A third-generation Washingtonian, the prominent real estate developer spent the past 60 years amassing one of the world's most significant private collections tracing the city's transformation from swamp to a thriving seat of national government. 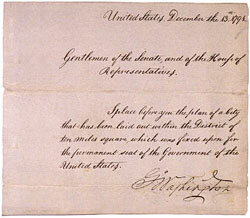 In February, the passionate collector and philanthropist announced that he is donating the extensive archives—containing historical documents, letters, rare books, maps, drawings, prints, and photographs of the capital city—to the George Washington University to benefit future generations of students, scholars, and citizens. Mr. Small pledged an additional $5 million to GW to assist in the transformation of the 156-year-old Woodhull House at 21st and G streets, N.W., and an adjacent lot, into a permanent museum that will be open to the public. The new portion of the building will feature a dedicated gallery housing permanent and rotating exhibits of collection pieces, as well as related academic and scholarly activities. The collection will also be digitized for the Internet. A prominent space in the renovated Woodhull House will be named the "Albert H. Small Center for National Capital Area Studies," which will integrate the collection into a wide range of academic studies at GW. Signage at the G Street entrance to Woodhull House will read "Historic Woodhull House: Home of the Albert H. Small Washingtoniana Collection." The entire project is slated to be completed by 2014. Hundreds of rare maps and prints documenting the history of Washington cover the walls of the Bethesda, Md., offices of real estate developer Albert H. Small. A veritable treasure trove of Washingtoniana, the unique collection features items ranging from a 1790 manuscript map of the region before the establishment of the nation's capital, to George Washington's 1791 letter to Congress outlining the 10 square miles that would ultimately become the nation's capital. Washington Circle is the focus of an 1865 colored lithograph—featuring Camp Fry, which occupied much of today's Foggy Bottom, and Clark Mill's equestrian statue of George Washington. Another highlight of the collection is the War Department's April 1865 reward poster offering $100,000 for the capture of President Abraham Lincoln's assassin and accomplices. The archive even includes views of Washington that never came to be, such as a colored lithograph of the proposed site for the World's Exposition of 1892 on the Mall; Washington ultimately lost out to Chicago as host of the event. GW Magazine was treated to a taste of the collection during a recent visit to the Bethesda offices of Southern Engineering Corp., the residential and commercial real estate company established by Mr. Small in 1950. Hundreds of framed prints and rare maps cover the walls of the suite, and Mr. Small recounts the stories behind each piece with scholarly detail and passion. GW Trustee Robert G. Perry, BS '70, who serves with Mr. Small on the National Trust for the Humanities, says he has "never known a more generous person." "The collection tells the story of the development of Washington and what it took to get the city off the ground," says Mr. Small, who researches each potential acquisition and participates actively in D.C.'s historical community. As a young man growing up in Chevy Chase, he never dreamed that he would become one of the nation's most prominent private collectors of historic memorabilia. "I was first bitten by the collecting bug when I got out of the Navy after World War II," he says. "Washington was a small town in those days, so I used to go up to New York City from time to time to marvel at the big-city excitement." One of his favorite pastimes in New York was browsing in old bookstores. In 1950, he came across a book about Washington that captured his imagination—an early 20th-century manuscript documenting the author's search to locate and photograph the 40 milestones placed around the perimeter of the city by its surveyors. "I bought the book, which I have to this day, and it whet my appetite." Sixty-one years later, the collection is still growing. "I receive catalogs every week from dealers and auction houses around the country and am traveling to the New York book fair this weekend to look at some prints," he says. "When you are a collector, it never stops. It's in your blood." Mr. Small—who continues to serve as president and CEO of Southern Engineering—has devoted substantial time and energy in recent years to searching for permanent homes for his remarkable collections. In 2004, he donated his sizable Declaration of Independence collection—widely believed to be the most comprehensive of its kind—to the University of Virginia, his undergraduate alma mater. The collection contains a complete set of autographed letters of all 56 signers of the Declaration of Independence, as well as one of the few original John Dunlap printings of the document, this one owned by George Washington. The following year, Mr. Small donated an 1801 J. Benford watercolor of the White House—the earliest known image of the structure—to the White House. The Smithsonian's National Museum of American History is now home to the Albert H. Small Documents Gallery, displaying rare and historically significant documents. 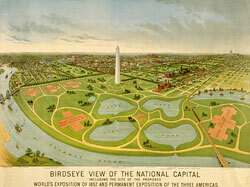 The collection even includes views of Washington that never came to be, such as this 1888 colored lithograph of the proposed site for the World's Exposition of 1892 on the Mall. Washington ultimately lost out to Chicago as host of the event. In recognition of his longtime support of the humanities, Mr. Small received the 2009 National Humanities Medal, presented to him by President Barack Obama at the White House. The official citation lauds the humanitarian's "devotion to sharing early American manuscripts with our nation's cultural and educational institutions as a philanthropist and collector" and praises his generosity, which has "helped educate countless Americans about those who founded our country." 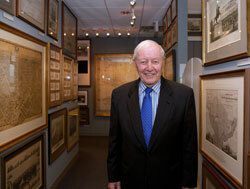 Mr. Small's gift to GW ensures that his remarkable collection endures as a national treasure. "This collection, which will be open to the public, will provide unparalleled opportunities not only for current students and scholars, but also for future generations to study the history of our nation through the study of this nation's capital," says GW President Steven Knapp. 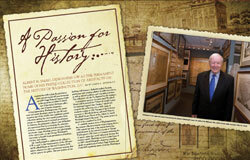 "The collection that Albert Small is donating to GW will be a center of knowledge about the federal city—how Washington was planned by the Founding Fathers, how it evolved socially, physically, and economically, and the trials and tribulations it endured along the way," says Robert G. Perry, BS '70, chairman and president of the National Trust for the Humanities and a trustee of the George Washington University. "The university is deeply honored to be the recipient and guardian of such an historic collection." This 1826 print by Henry and James Stone features a north view of the White House without the portico, which was added later by President Andrew Jackson. "Albert Small is one of the most unique people I've ever met," adds Mr. Perry, who serves with him on the National Trust for the Humanities. "I have never known a more generous person. He understands the importance of history and of giving back and is very pleased with his decision to donate his collection about Washington to GW, where it will be available for generations going forward." Congratulatory letters and calls poured in from alumni, friends, and trustees of the university in response to the Feb. 28 announcement of Mr. Small's gift. "Everyone is ecstatic about the gift, which will allow for full access to the collection by faculty and students at the university and around the world," wrote Luther W. Brady, BA '46, MD '48, distinguished university professor at Drexel University College of Medicine and an emeritus trustee of GW. "Albert Small's collection of Washingtoniana is extraordinary in its scope and historical importance," says Mark R. Shenkman, MBA '67, president and chief investment officer of Shenkman Capital Management and a GW trustee. "His generosity will enable future generations of Washingtonians, students, and scholars to come together to see and better understand the rich history of our nation's capital." Mr. Small's collection includes a rare handkerchief map of the city of Washington based on the Samuel Hill engraving of Andrew Ellicott's plan. 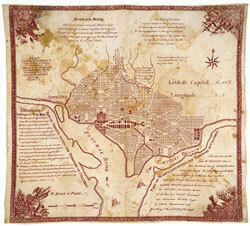 The handkerchief was printed in Boston and sold in Washington as a souvenir. "We are delighted to have such a fantastic collection available for student and faculty research, as well as for scholars around the world," says Lisa Benton-Short, associate professor of geography. "Geography has long been home to the field of historical cartography, so it is wonderful and very appropriate that this collection come to GW where such scholars can use it. Every map has a story behind it and geographers are trained to uncover, analyze, and evaluate these stories. My colleagues and I are also looking forward to having students use the collection to better understand the evolution and development of Washington, D.C., both imagined and realized. It will be an invaluable teaching tool." Mr. Small's quest to bring history to life for students is also manifested in his recent decision to create and underwrite the "Normandy: Sacrifice for Freedom" summer institute, sponsored by National History Day, which will premiere this June. The 10-day program for select high school student-teacher pairs will begin in Washington, with a rigorous course of study about World War II and D-Day, and culminate in France, where participants will walk in the footsteps of history on the beaches of Normandy and visit the American cemetery there. The collection also includes an 1865 broadside published by the War Department, advertising a reward for the capture of President Abraham Lincoln's murderer. "The most dramatic place I've ever visited is Omaha Beach in Normandy, and once young, impressionable high school students see it, they'll never forget it," Mr. Small explains. "The world would be a very different place today if we had not been successful on D-Day. I want young people to see firsthand how fragile democracy is and understand that freedom comes with a price." Mr. Small's myriad contributions to the humanities are matched by his lifelong commitment to excellence in real estate, which has helped shape the regional landscape. His company has developed millions of square feet of office space in Washington as well as apartment communities and single-family homes in the D.C. metropolitan area, Baltimore, Richmond, Norfolk, and Newport News. 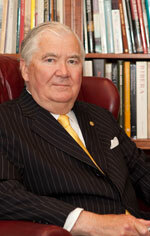 Throughout the years, he also has found time to serve on numerous civic and cultural boards, including the National Symphony Orchestra, the National Gallery of Art, the Foundation for the National Archives, the James Madison Council of the Library of Congress, and the Life Guard of Mount Vernon, to name a few. A highlight of the collection is George Washington's 1791 letter to Congress outlining the 10 square miles that would ultimately become the nation's capital. But bricks and mortar pale in comparison to the satisfaction he derives from preserving and sharing America's heritage with future generations through his prized collections. "I'm glad that my Washington history collection will be the centerpiece of a broad range of studies and symposia at GW, where it will get excellent exposure and help people better understand and appreciate an important part of America's history," Mr. Small says. "Every year, several thousand new students arrive at GW, who will be able to see and experience the history of our nation's capital through the museum. Young people are carrying the ball for the future of our country and many know very little about our history. I hope that the museum helps turn that around."